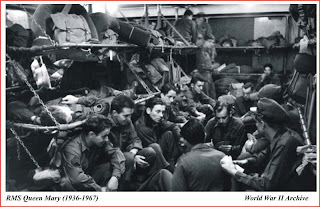 On this day in 1945, World War II Voyage #46 (westbound) on the Queen Mary arrived in New York to pick up more American G.I.s and carry them back to the ETO. The ship, piloted by Commodore James Bisset, had averaged 23.79 knots while crossing the pond in a zig-zag pattern, and had taken over five days to complete. In the week that followed the ship's arrival, 11,226 American troops would board the Gray Ghost, shipping out for the last three and a half months of war in Europe.